Cupcakes 'n Daisies: Finally Off that Mocha Trail . . . . It sure feels good to have this project move from my To Do list to my Lifetime Quilt list. The pattern is Mocha Trail, A Graceful Stitch Quilt Design by Denise Sheehan. The fabric, all Maison de Garance by French General for Moda. It took me longer to finish this project than it should have. 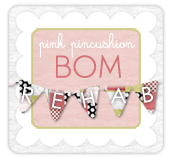 I like to work on projects that make me want to spend every spare minute in my sewing room. A project that makes me fly through my daily To Do list so I can sew guilt free the rest of the day. If Nicole and I hadn't set a reveal deadline of today, I suspect those borders would not have made it on this quilt today. Now that it's all done, I am happier with the overall look, but not as happy as I was expecting to be. But that's OK, not every quilt is going to be my favorite quilt. I ordered extra yardage for this border. The dark brown and bright red really appealed to me. 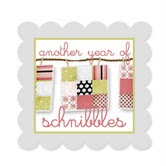 But once I started making the star blocks, I realized I needed a different border. One that would work with the light tans. So I switched to this border. I get asked about fabric requirements quite a bit, so I'm starting to provide a little fabric information when I wrap up a project. I started with a fat quarter bundle that had 38 pieces of fabric and the corresponding wovens, I think there were 12 of them. 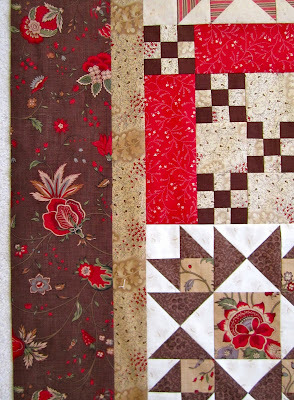 I also added an extra yard of the red floral and dark brown for the 9 patches block, another yard for the containment border and the outer border fabric. I have a good quantity of fabric left over, 22 fat quarters weren't used at all, and of the ones that were used, there was a good quantity of fabric remaining. I like this fabric so I'm happy I have enough "scraps" to make another project. Looking back on it, using a fat quarter bundle for this project was probably a waste. If you were thinking of making this pattern, you would probably be better off selecting your border fabric first, then just picking out a dozen or so fat quarters that go with the border, and some yardage for the 9 patches block. Nancy, Near Philadelphia just finished this pattern also, click here to see her version, another interesting take on this pattern. This is Lifetime Quilt number 63, finished at 76" x 76", and has approximately 1261 pieces. So I'm going to do my usual after project sewing room clean-up, pack up my scraps, and then start seriously thinking about my plan of attack for Root Beer Float. I have decided on the fabric, Olde World Style fabric by Monique Dillard for Maywood Studio, but I've yet to come up with the perfect combination of fabrics for those star blocks, something to think about this weekend as I continue to decorate. I hope you have a wonderful weekend, it's such a busy time of year, I hope you're able to take a little bit of time to do what you want to do, instead of a weekend full of nothing but what you have to do. Still pretty even if it's not your fav :) I like the information you are giving about what and how you chose the fabrics and what you would do different after you had made it. What can I say...it has lots of red and that floats my boat! :) LOL! I will say that I honestly was never really trilled about this pattern but when you added the splash of color it brought the pattern to life. It made a huge difference. I like the new border, the design is bigger and showcases the fabric while the other was really just a containment border.. It definitely adds interest to the border. It really turned out quite wonderful. I hope that when you have it quilted it will be raised in your estimation. Funny how Nancy was not thrilled with the outcome either. I'm hoping Nicole has found it more to her appeal. Her blues were great too! Have a Fantastic Weekend!! It's a beautiful quilt Thelma...I love the new border you chose...it really "pulled the whole quilt together". Quilted and washed it will be a warm. comforting quilt. Even though you aren't completely thrilled, I think it is positively beautiful. I love the colors. It's fun to see all three different quilts- all very pretty. Thanks for sharing the info. I think this is a very handsome quilt. I agree that each quilt cannot always be our favorite, but all in all this is a very nice quilt. 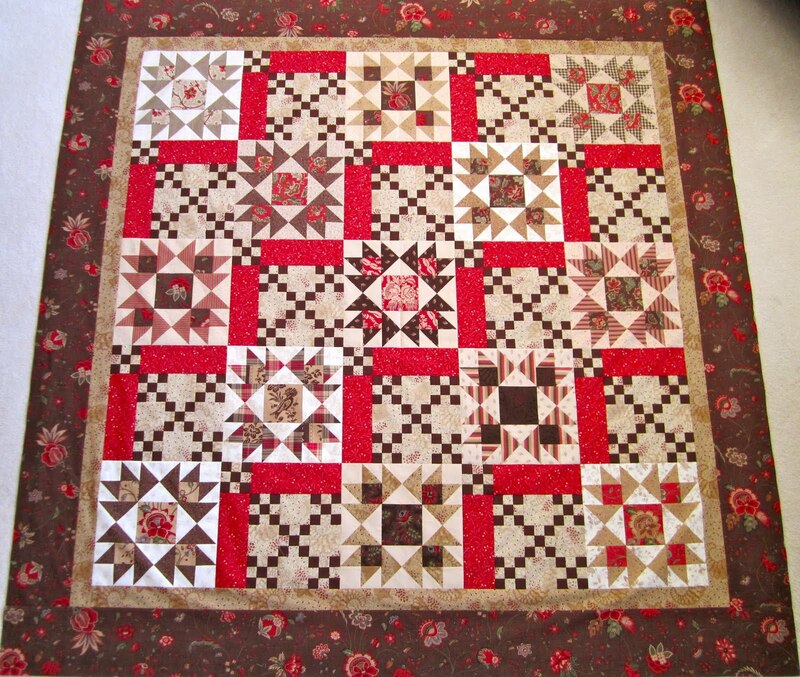 The splash of red electrifies this quilt. I love how you gals each used a different color way to showcase this pattern. Beautiful quilt! I bet this will be a great curl up on the couch quilt, all soft and yummy. Great job finishing up. Oh, Thelma it's gorgeous. I love it. The border fabric was a very good decision. I just love how you incorporated the reds. It can go on my list of favorites! I really like the quilt. It was fun to see the three versions - all so pretty. SWOON! That is beautiful, Thelma!! You know, Thelma, you are going to like that quilt so much better once you have it quilted. It is a perfect size for a "back of the couch" quilt, and the colors go with your decor wonderfully. I think your version is just beautiful. It's beautiful! You two used some of my favorite fabric lines and I love them both! Looks great! I love the colors. 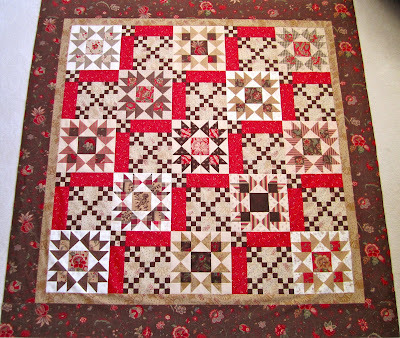 You are such a fast quilter, this project would have taken me a year to complete. I was surprised when you mentioned you bought the fat quarter bundle, that would have been too much fabric. But it's the way we learn how to buy fabric, through trial and error! I can't wait to follow your next quilt! Beautiful quilt! Love the colors. Oh Thelma~ I love it! The browns and reds are just perfect! Have a happy weekend! YOur quilt is stunningly gorgeous Thelma. The colors are rich and give an heirloom quality. Beuatiful job! What a pretty version - I like it better than the original. Love it!